You are here: Home » MEDIA » Films » Looper film review (Frank’s Take). Mind-bending time travel movies routinely have a robust and surrealistic edginess that caters to the absolute essence of science fiction fanatics. Still, that is not always enough to convey the concrete convictions of a sci-fi time travel tale that percolates beyond its visual mastery. Sometimes one needs the inclusion of a challenging plot, thought-provoking characterizations, unexpected twists and turns plus an overall riveting storyline to successfully sell its intriguing exposition. Writer-director Rian Johnson’s ‘Looper’ looks to fulfill the ultimate stylish joyride as a thinking man’s sci-fi spectacle. Sharp, edgy, captivating and complex, ‘Looper’ radiates boldly as an ambitious futuristic fable that is both refreshingly inventive and uncompromising in its impacted suspense. Johnson (‘Brick’, ‘The Brothers Bloom’) delivers a mesmerizing maze that dazzles within the colorful conventions of this eye-popping genre. The pacing is undeniably energetic and should serve the interests of the audience embracing this intricate cerebral actioner that thoughtfully sizzles with gritty forethought. In LOOPER, they are not what you would call your Average Joes. Joseph Gordon-Levitt (Johnson’s ‘Brick’ star) plays Joe a.k.a. a ‘Looper’, a low grade hit-man based in Kansas in the year 2044. Joe has the dubious task of working as an assassin whose mission is to eradicate hooded mob targets sent back through time from thirty years in the future. Joe, who is armed with his weapon of choice — a blunderbuss – disposes of his victims methodically. Joe does not bother in familiarizing himself with the prey he is contracted to terminate on the spot. Strangely, Joe is all business – like as he snuffs out his intended object for the kill. The financial payoff, of course, is the silver that accompanies the bodies of the targeted subject. However, there is a no-no that states if a Looper kills someone with gold clinging to them then the penalty results in that individual sabotaging their own loop. Hence, you have basically killed yourself and violated the privileges that gold represents in living a rewarding existence. An important tidbit to realize is that it was ruthless gangsters controlling the illegal time traveling tactics as a convenient means to dump off their enemies. After all, it is more sensible to dispose of their foes and let a Looper whack them as opposed to leaving the remains as possible evidence against them in their current world. It should be noted that Joe is not what you would call your average choirboy living a simplistic life. Aside from his looping slaying activities, Joe is a drug-addled soul that leads a rather meager existence. Mischievous and meandering, Joe indulges in the excesses of what Loopers normally engage in with narcotics and loose women. In fact, Joe regularly enjoys the company of his favorite prostitute Suzie (Piper Perabo). Amazingly, Joe does dream of something much bigger in store for him after his dubious days of loop killing. Understandably, Joe harbors a paranoia concerning the possibility that his superiors may consider closing his loop therefore setting up an eerie arrangement where Joe will possibly end up murdering his older self before the mob gest to him. So the pursuit of Joe trying to meet up with his older persona in ‘Old Joe’ (Bruce Willis) is even more confusing in that he has to tangle with the super villain the Rain Maker. Specifically, the mysterious Rain Maker’s reign as a menacing culprit behind the looping interference adversely affects both Joes immensely. As both Joe and Old Joe are being hunted down as they figure out the identity crisis of their youthful and elder prototypes, Joe comes across Sara (Emily Blunt) and her young charge Cid (Pierce Gagnon) on a remote farm. A romance blossoms between Joe and Sara as she takes on his hidden angst and joins in the dilemma to reunite this lost soul with his matured alter ego. There is so much to ‘Looper’ in terms of its creative angles and revolving plots that mingle the cunning and imaginative intrigue with the modest tapestry of technological aesthetics that capture the conflicted makeup of the slit protagonists literally trying to get a grip on their search for being. The usage concerning flashback and flash-forward sequences solidify the opulence and wonderment of the mystical time periods involved. In watching Looper one has to equate the experience with that of a perplexing mathematical equation as it begs you to piece together the logic and solution of its given problem at hand. 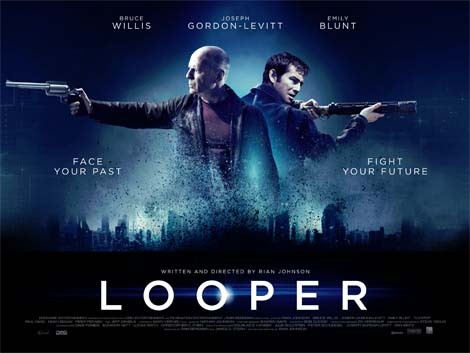 The fact that ‘Looper’ is not an easy sci-fi actioner to define is the appeal of Johnson’s tongue-twisted narrative that dares to be structured distinctively in probing characters and the situational compass of a cohesive, alarming thriller. Both Gordon-Levitt and Willis are compelling as the looping longshots in search for a preferable destiny that overshadows their current state of oblivion. The whole proceedings are creative, calculating and marked by an adrenaline rush that more sci-fi fare should incorporate when conceiving an involving escapist showcase highlighted by a concoction of oversized guns, telekinesis phenomenon, and riff raffish hangers-on. Smart, adventurous, impishly contemplative and wild, Loopers is brimming with a magical magnetism that is a feast for the filmmaking eyes. An exciting time-travel treat that is entertainingly hypnotic in its hedonistic hubris. « Editorial – October 2012.